Ferrari driver Kimi Raikkonen ended the final day of Barcelona Formula 1 testing with the fastest time, as McLaren and Renault both made up for lost ground on Friday afternoon. Raikkonen's morning effort of 1m17.221s was not threatened in the final afternoon of pre-season running, although a spate of late runs in the final hour did shake up the order behind the Finn. Daniel Ricciardo was the first to make a big move with 45 minutes of the session to go, jumping up to second in the Red Bull on supersofts, before he was usurped by both Carlos Sainz Jr and Fernando Alonso. Sainz did not get his day going properly until around two hours were left, after Renault had to replace his RS18's gearbox, but went second fastest with 30 minutes to run on hypersofts. 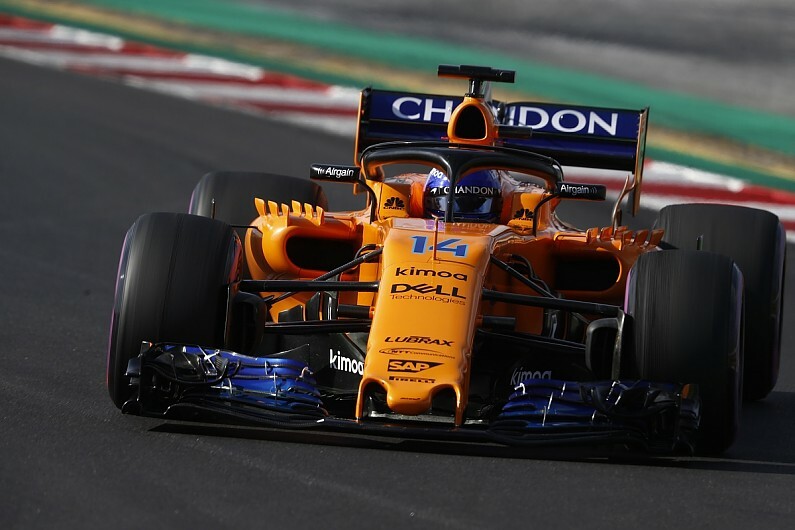 But the Spaniard was beaten to the runner-up spot before the end of the day by compatriot Alonso, who was making up for lost time after a turbo issue caused the McLaren to stop on track in the morning and lose over five hours while its Renault power unit was changed. Using hypersofts, Alonso posted a 1m17.981s to go second and then improved to a 1m17.784s to end the day 0.563 seconds slower than Raikkonen. Alonso did briefly jump to the top of the times in the final 10 minutes, but had his lap deleted for cutting the final chicane. He ended the day with a total of 93 laps to his name. Romain Grosjean was the day's most productive runner for Haas with a tally of 181 laps, the best of which was good enough for fifth-fastest behind Ricciardo using ultrasofts. Valtteri Bottas took over testing duties from Mercedes team-mate Lewis Hamilton in the afternoon, going sixth fastest on mediums and giving the champion outfit a combined session-topping total of 201 laps. After his morning spin, Charles Leclerc used hypersofts to move up to ninth in the Sauber behind Brendon Hartley (Toro Rosso) and Force India's Esteban Ocon. Sergey Sirotkin (Williams) completed the top 10 after handing over to Lance Stroll for the final few hours, with the Canadian again setting the slowest of the day behind Hamilton using softs.